Mrs. Lawal obtained a Bachelor of Arts degree in English from the Obafemi Awolowo University, Ile-Ife. She also holds a law degree from Anglia Ruskin University, Cambridge U.K.
She has a Master of Science degree in Corporate Governance and Finance from the Liverpool John Moores University, Liverpool U.K. and a Masters’ degree in International Law and Diplomacy from the University of Lagos. She is a Barrister & Solicitor of the Supreme Court of Nigeria and a member of the Nigerian Bar Association. 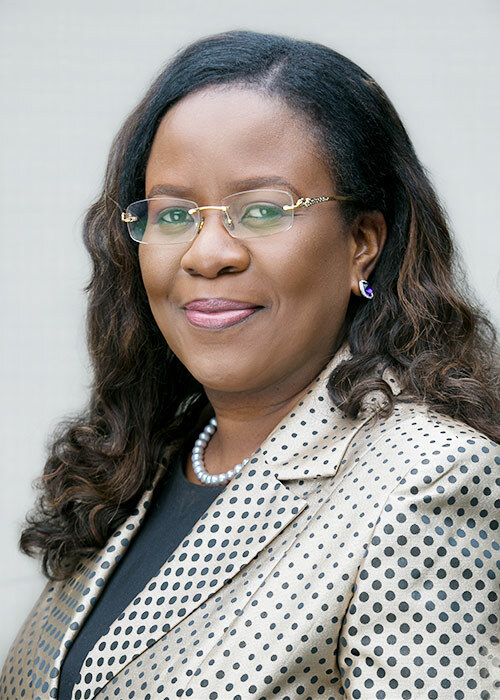 She is a Certified Pension Practitioner and an associate member of the National Institute of Marketing of Nigeria (NIMN) and has over 15 years’ experience in Investment Banking and Business Development. She is a member of the Nigerian Society of International Law and an Associate Member of a number of professional organizations including the Nigerian Institute of International Affairs, the National Institute of Marketing of Nigeria, the Certified Pension Practitioners, the Institute of Capital Market Registrars and the Institute of Directors (IoD). She is a Co-founder and Group Executive Director at GTI Group, a foremost investment banking firm in Nigeria. She currently serves on the Board of International Breweries Plc as a Non-Executive Director. She joined Eterna Plc as a Non-Executive Director in 2009.